With the 100th Anniversary of the BSA coming up in 2010, a commemorative Boy Scouts silver coin will be issued. The House of Representatives passed H.R. 5872, an act "To require the Secretary of the Treasury to mint coins in commemoration of the centennial of the Boy Scouts of America, and for other purposes." Now, the Senate will pass the bill and the President will sign it into law. The bill has overwhelming support and will most likely pass into law easily. Interestingly, $10 from the sale of each coin will go to the BSA which could result in $3.5 million in funds to the organization. And, with virtually everything related to the Boy Scouts, there certainly is a differing opinion out there. Last year, in 2007, a 50p commemorative coin was issued by the Royal Mint in England to recognize the 100th anniversary of the world scouting movement. Scouting was begun in England in 1907 by Lord Baden-Powell and quickly spread around the world. Many other countries have issued coins to honor the Scouting Movement as well. This Turkish Scouting coin recognizes Boy Scouts and Girl Guides. There were only 5000 of them minted. Australia is celebrating their Scouting centenary this year in 2008. The country has actually declared 2008 to be the Year of the Scout. To keep the party rolling along, the Aussies have quite a selection of souvenirs. The Australia Post has issued three cool scouting stamps. The Royal Australian Mint has issued this $5 commemorative coin, $10 commemorative coin, $.50 commemorative coin, and a $1 circulatory coin. You can read more about the coins, including prices and volumes minted. The commemorative coins have very low volumes, making them quite valuable. We do everything in patrols in our troop so the largest bottles we use are the small disposable ones but I know a number of troops around our area use 20lb propane bottles for their cooking at summer camp. The National Propane Gas Association has issued an alert to warn folks about inspecting the propane bottles they get when exchanging them at refill stations. It seems propane cylinders are being used in the manufacturing of Meth to store anhydrous ammonia. This can corrode the brass and possibly cause an explosive failure. So, be sure to check propane cylinders you pick up for camp. See NPGA Alert for details. Our latest Eagle scout had his ceremony this past Sunday. It was a practically perfect affair with many scouts involved with short lines, all correctly memorized. Everything went off without a hitch, including the 10-minute video of the scout's career, lighting of a table full of candles of all shapes and colors, and food and cake served afterwards. It was all really very nice. For my part, as scoutmaster, I had way too much script to read but I plugged ahead. I'm used to a scoutmaster minute rather than a scoutmaster 5- or 10-minute. :-) But, it was fun. 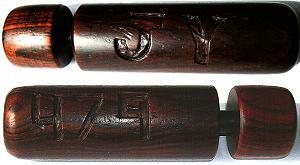 As a gift for the Eagle, I whittled the troop numerals and the scout's initials into a fire piston kit. The stain I used made it too dark to see very well in the picture. The kit is from FirePistons.com and is a completely working fire piston ready to carve or finish however desired. My plan is to custom carve one for every new Eagle coming out of our troop. In case you didn't know, a fire piston is a waaaaay cool way to demonstrate fire starting. With just air pressure, a bit of tinder ignites almost magically. It's more work than a BIC lighter, but a lot more fun and there's always a few scouts wanting to try it. If you're looking for something interesting to get a scout advancing in rank or one that is in to fire, check out fire pistons. I'm hoping to improve my carving as I do more of them. As most folks know, the official BSA national website is at scouting.org which is a great domain name for the organization. But, in the Internet world, good domain names can be bought and sold for hundreds and thousands of dollars. Just think of an interesting name such as hike.com or camp.com and it's probably already registered. And, there's a good chance it is just a place holder, reserved by someone hoping to sell the domain name instead of actually create a site with any value to it. That's why it's pretty cool that a fella named John Hall has donated the domain names of BoyScouts.com and BoyScouts.org to the BSA. Those URLs now redirect to the Scouting.org site that has this press release. Mr. Hall could have sold those domain names for a lot of money, but he chose to give them to the BSA. This simple action will benefit many people that are looking for the BSA site and search for a match. Instead of being sent to some garbage site, they'll actually get to the right destination. There are many different ways people can support the scouting movement. I think this action by Mr. Hall demonstrates that the breadth and depth of our impact is only limited by our imagination and resourcefulness. - Scouting.com redirects to Draft.com - a football site. - CubScouts.org is used by Pack 474 in Wauwatosa, WI. Also, if you didn't know Scout.org is the home of the World Organization of the Scout Movement. Every 6 months, the newly-elected SPL gathers his gang and decides on the troop activities for 6 months a year in the future. By doing this, the troop has a rolling 18 month schedule and patrols are able to plan ahead. That doesn't necessarily mean they DO plan ahead, but they can if they want. On Sunday, the new SPL called his patrol leaders together to have them share campout ideas and choose the ones to do. As is often the case, only a couple brought ideas, but the SPL had the list of everything the troop has done in the last 8 years so he could offer other suggestions. In just an hour, the scouts decided the 6 monthly campout ideas for April-September of 2009, which patrols would be responsible to plan each, and a couple high adventure ideas. They've included Pioneering, Bike Rally, Waterworks, Wilderness Survival, Shooting Sports, and summer camp. They're also planning a high adventure hiking/sailing outing on Lake Superior and possibly a crew to SeaBase. Sounds like a good summer to me, and they did it themselves. 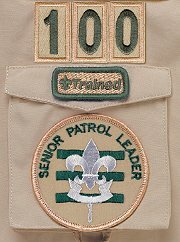 The BSA Centennial Uniform is on its way! The word is out! New design for the BSA scout uniform comes out in August, 2008. The colors are pretty much the same so new uniform pieces can be transitioned as old ones are outgrown. A big difference is red shoulder loops and unit numbers are now forest green. The uniform is being promoted as more versatile and wearable in the field instead of just for meetings. I do think the new BSA baseball-style cap is a big improvement. The switchbacks are staying around. See BSAUniforms.org for details or this PDF file. I'll be presenting Wilderness First Aid Basics to scouts at summer camp in July. Camp Many Point is starting a new "All Things Emergency Response" program for one week this summer. I'm fortunate to be a part of the new program and hope it is a big success to continue and grow. There's currently 10 scouts signed up so it's off to a good start. The local sheriff's office and Mounted Search & Rescue teams are scheduled to present their programs to the scouts, too. I just saw the outline for the week and it's packed with activities and surprises. The scouts get to participate in mock sea rescues, ice rescues, lost hikers, airplane crash, and a mess of various wounds and evacuation drills. At the end of the week, scouts will have CPR certification, WFAB certification, Emergency Preparedness and Safety merit badges, and experience in many emergency scenarios. There is a video about the program, but it's a little long. There's often discussion of 13 or 14 year old Eagle scouts - scouts that plow through the ranks in less than 3 years. This isn't a very rare event. I believe a much more rare thing is to have a 16 year old boy join Boy Scouts with a goal of reaching Eagle before aging out. This past weekend, I met a scout doing just that while I was presenting a Wilderness First Aid session. A 16yr old guy just joined a local troop in March with no prior scouting experience. He is now Tenderfoot and has most of his 2nd and 1st Class requirements completed. The 16 months of troop leadership will be a challenge, but he seems to be working very hard at the lower ranks. It's kind of weird to see a scout taller than me demonstrating how to sharpen his pocketknife and hunting around for signs of 10 animals. :-) He's extra motivated to complete First Class before July, not just to reach Eagle but because he's scheduled to attend Philmont in August! I will be using these two examples for a long time when talking to the troop about being on the look-out for new boys and old friends to invite along on the adventure. On the Boy Scout Trail's Eagle Scout page, I have a link to a fillable PDF file of the new 2008 Eagle application. Feel free to download and have your scouts use this. It should make life easier all around. This was created by some scouters in Northern Star council. There are also links to a Word doc or PDF version of the new Eagle Project workbook on that page. Question: My husband and his friend lead a local Boy Scout troop. They have attempted this year to bring organization to a Troop that had some lax requirements for advancement. One of the things they require is a 60 percent meeting attendance. Word is that several of the older boys working toward their Eagle are leaving the troop for another church troop that only requires 50 percent attendance. Is there a national requirement for meeting attendance? If so, we want to do what the national office requires, regardless of the loss. The short answer is "No, there is no meeting attendance requirement." I'm a Scoutmaster of a troop of 60 scouts now. I try to manage our troop following the BSA guidelines and rules all the time. I've been through Scoutmaster training and I read the Scoutmaster Handbook, Field Book, Guide to Safe Scouting, and any other BSA literature I can acquire. I use these as my sole direction when it comes to requirements, rules, and regulations. I've spent lots of hours talking with other Scoutmasters just to find out how their troops are run. I've sat in on their troop meetings and talked with scouts in other troops as often as I can. The reason I do this is because I'm always looking for ways that our troop might improve. The requirement to be 'active in your troop' for Star, Life, and Eagle scout rank advancement is a difficult one to interpret. The BSA has purposefully made it vague because every scout's situation is unique. This gives the Scoutmaster leeway for each scout. Without specific requirements such as "attend 60% of troop meetings", a Scoutmaster could play favorites or could make things very difficult for some certain scouts. Unfortunately, I know that has happened. Many troops have done exactly what your troop is doing - setting a percentage requirement. That is not a good thing. It tells scouts they 'have to' attend a certain number of meetings rather than having them 'want to' attend. It also takes a great method of self-evaluation away from them. I believe a better solution is to talk with the scouts as they advance and let them know that 'being active' and 'demonstrating leadership' are requirements they need to fulfill in order to advance. I try to have a Scoutmaster Conference at least every 6 months so the scout can check in and let me know how he is doing. The best way I've found to decide if a scout is being active or not is to ask him. Usually, a scout knows if he is participating enough or not and will tend to be harder on himself than I will. There are some that will try to fake their way through, but they tend to be pretty obvious too, and then I pull out the report of how many activities he has participated in and ask him to explain how his participation equals 'active participation'. If a scout no longer enjoys scouting, then he should not be in scouts. Whether it is 10% or 80% of the troop activities that he is being forced to attend just to get the next rank, he is not a scout fulfilling the requirements to advance. If a scout is active in football and track and comes to the 40% of troop activities that he can and demonstrates scout spirit, leadership, and fellowship while he is at them, then that is 'actively participating'. Just to be sure you understand, it sounds good on paper, but every 6 months when the scout leadership changes, I start over from scratch training the new leaders on expectations. Sometimes it works great. Other times I find myself looking forward to the next 6 months. :-) When a troop is really led by the scouts and supported by adults, it will have high times and low times, very dependent on the scouts in leadership positions. If a troop runs efficiently and consistently, it is probably too dominated by adults. Our two Philmont crew leaders came up with a schedule of 5, 10, and 20 mile hikes to prepare for the treks. There's a total of about 250 miles planned and everyone is expected to participate in at least 110 miles. In addition, we're supposed to get more conditioning on our own through sports or exercise. Some of these scouts are also undertaking the Hiking merit badge so each 10 and 20 mile hike has a planned route and trip plan created for it. The scouts write up a short report after the hike about the weather, terrain, environment, and interesting observations. On Sunday, I participated in the first 20-miler - we have another the end of May. One scout laid out a 20-mile loop through a large county park on the other side of town so it was new territory and not redundant - but then he couldn't attend. :-( So, he missed the rain, and the sleet, and the 2 hours of SNOW! He also missed the deer, owls, snow geese, swans, hawks, and other assorted critters. These scouts keep almost a 4MPH pace when hiking and take very few short breaks. We completed the hike in just about 6 hours - and it was definitely a full 20 miles. The most common comment at the end was "Well, I won't have to do THAT again!" The requirements for the Hiking merit badge include five 10-mile hikes and one 20-miler. So, I've now hiked the 84 mile distance of our scheduled trek #32. I'll do it again over the next 5 weeks and then it's the real thing. It looks like our longest day on the trek will be about 12 miles, but with backpacks, terrain, elevation, and altitude, that will be a lot more of a challenge than any 20-mile flatland hike down on the prairie.